The scooters have yet to be proven effective on the field. 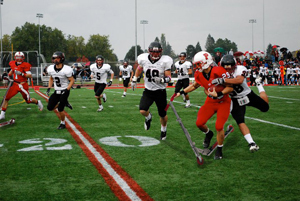 What was once recreation for few will soon be required of Pacific’s football team. The commonly seen Razor Scooters being ridden by some Boxers are required of the whole team at the start of April. “We are hopeful that the addition of scooters will improve every aspect of the team,” said Coach Ken Buck. The coaches plan on issuing Razor Scooters the very first meeting of the season. The hope, said Buck, is that the scooters will improve speed, school attendance, team unity and overall attentiveness. With their scooters in hand, coach Matthew Lou said the Boxers are expected to arrive at class on time and thus improve the team’s overall GPA. As the team pushes their way to class they will also be pushing their muscles to the next level. Coach Ike McCob estimates the Boxers will be 12 percent faster on the field since they will be advised to switch off their pushing legs while using the scooters. In fact, a whole 29-page advisory manual will be handed out to the Boxers in order to yield the best possible results from “the scooter exercise diet,” as Coach Aron Sky calls it. Along with the manual, all Boxers will be required to take a scooter safety class. This class will take the place of practices until every Boxer passes the street obstacle course. Coach Buck said he hopes that the Boxers will apply the awareness that goes with the safety of riding a scooter to difficult life situations as well. The Boxers will be able to pick from a black, red or white razor scooter, Pacific’s colors, to further unify the team.